Lutterworth-based Core Management Logistics (CML), has raised £50,000 for Rainbows Hospice for Children and Young People. The charity provides care and support to children with life-limiting illnesses and their families and in 2007, CML decided to make Rainbows its nominated charity. Through a variety of company fundraising events and initiatives held by CML, including Rainbows recent Wheelie Bin campaign – Where’s it Bin!, the grand total raised at the end of 2018 came to a £45,150. 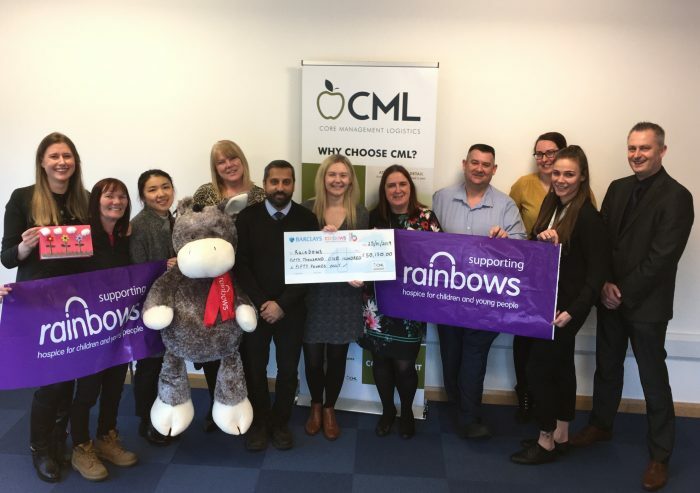 The Charity and Events Team had an strong 2018 which means that CML has now presented Rainbows with a further cheque for £5,000 in January 2019 taking the grand total raised for the charity to a tremendous £50,150. Emily Wright, Corporate Partnerships Fundraiser at Rainbows, added: “Here at Rainbows we are almost entirely reliant on donations to keep providing vital care and support to children and young people with life-limiting illnesses, and their families.